If a bull could run on water, it would be the 2011 Sea-Doo RXT-X aS 260. Simply put, this watercraft is a beast. Anything that can go from 0-30 mph (48.3 km/h) in 1.7 seconds is definitely a force to be reckoned with. With it’s new stepped hull design, or S3 as Sea-Doo has dubbed it, this watercraft looks fast even when it’s standing still. The Sea-Doo RXT-X aS 260 may have the power of a bull on water, but with the fully adjustable suspension, it certainly doesn’t buck like one. 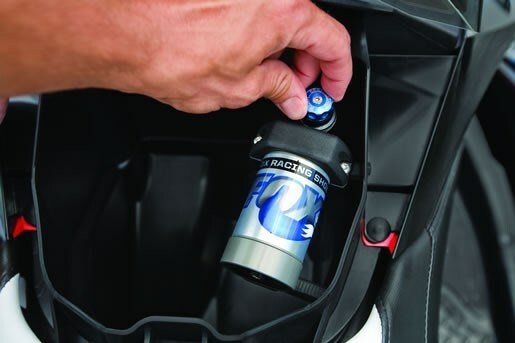 The aS stands for Adjustable Suspension, and by adjusting a Fox Racing Shock using a control knob in the see through glove box, the rider can manually tweak (either stiffen, or soften) the suspension on the fly, depending on the riding conditions. The stiffer suspension eliminates most of the bounce when encountering large waves or chop, and with the ability to accurately fine-tune the ride, this is a craft designed to handle the open ocean. This watercraft is basically designed with two separate halves. The lower half consists of the hull, while the upper half is comprised of the seat, footwells and handlebars. The suspension system provides an impressive six inches of travel, but equally impressive is the redesigned ergonomics. The footwells are now curved and sweeping, as opposed to sharply angled, and are also slightly canted inward to help eliminate any strain and pressure by providing a natural and comfortable riding position. The RXT-X aS 260 is equipped with Sea-Doo’s most powerful engine, featuring a fuel injected 1,494cc Rotax 4-TEC, combined with a supercharger and external intercooler. All this adds up to a very fast boat, which is electronically limited by the speedometer to 104-107 km/h (65-67 mph). Fortunately for the safety minded among us, all this power is not without some further checks and balances. Perhaps very wisely this boat features Sea-Doo’s iBR or Intelligent Brake and Reverse, which has a shorter stopping distance than any other watercraft on the market. The electronic reverse provides a level of maneuverability that makes more mundane activities such as docking almost enjoyable. Offering further control is the iTC or Intelligent Throttle Control, which starts you in neutral, and has 30 activity specific functions such as, Touring/Sport mode, tachometer, water temperature, and many others. With so much power under the hood, Sea-Doo paid a lot of attention to the control of this watercraft. The X-Racing features include; X-Steering with Adjustable Ergonomic Steering (A.E.S), which allows for adjustable handlebar width and grip angle, and X-Gauge, which comprises a speedometer, average speed, lap timer, high-performance VTS (variable trim system) and more. Also included is a seat with a lower profile, which is not only comfortable, but places the rider in a race ready position to really let you use your weight in the turns. Some inexperienced riders might feel a little uneasy when first riding this watercraft, as the higher center of gravity can seem a little unstable at lower speeds. But by its very nature, this is one PWC that wasn’t designed to go slow. As soon as you grab some throttle on this bad boy and get it up to speed, the suspension and superior hull design really stand out and it handles incredibly well, diving in and out of corners and blasting across open water waves and chop almost as if it isn’t there. The Sea-Doo RXT-X aS 260 comes in Black and Dragon Red, and every inch of this water devouring beast is sure to scorch the competition.